Web application firewalls play an important role in the security of websites as they can mitigate risks and they can offer protection against a large-scale of vulnerabilities.That is the reason that many companies in nowadays are implementing a web application firewall solution in their existing infrastructure.Of course an implementation of a WAF on its own cannot resolve the security problems that a web application might have and proper modifications must be made in order many of the attacks to be able to identified and blocked. Penetration testers must be aware before they start the web application engagement if there is a WAF in place as the results of their attacks can be affected.So if the penetration test is a white-box then this question should be asked in the initial meetings with the client.If it is a black-box then the penetration tester should try to investigate on his own whether or not there is a web application firewall in place.In this article we will try to examine the methods and the tools that will allow us to detect a WAF. Before we start it is always good to know where a WAF is usually used on a network.Most of the times a web application firewall is between a web server and a client like the one that we can see in the next image.However there are web application firewalls that can be installed directly into the web servers. The existence of a web application firewall can be identified with a variety of ways.A good indication is by checking the cookies because some web application firewalls add their own cookie in the communication between the client and the web server.For example in the next image we can see an HTTP request where a cookie has been added by the WAF.Specifically the ns_af unveils that the web application firewall is a Citrix Netscaler. 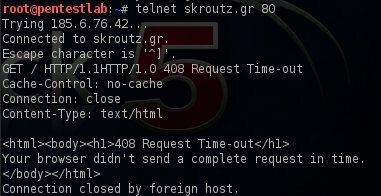 Another method is through the HTTP headers as many WAF products allow the header to be rewritten and they can also make the web server to produce different HTTP responses from the common ones.For example as we can see and from the image below the web server respond to our request with a message You shouldn’t be here and unveiled that is Varnish. Additionally a web application firewall presence can be identified in cases where you are trying to send a request and the session is expiring very quickly like the example in the next image. The most well-known tool that can detect and fingerprint web application firewalls is the WAFW00F.The usage of this tool is very simple and can discover a variety of WAF products.The next image is showing the successful detection of a Citrix Netscaler firewall that protects the website. 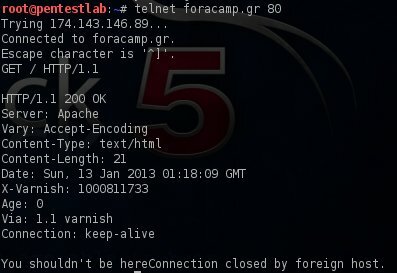 Finally there is a script that is capable only to detect Imperva WAF installations. 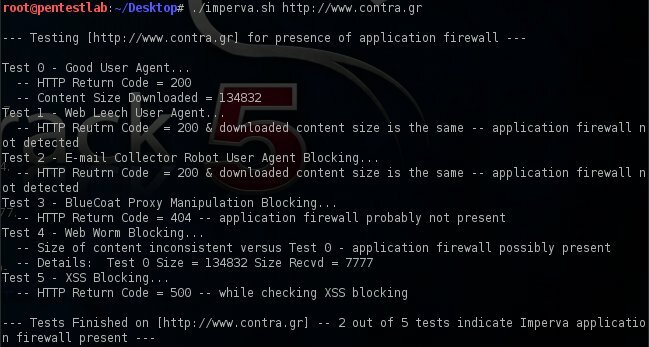 In this article we examined some methods and tools for detection of web application firewalls.This is an important process that must be done in every web application penetration test during the information gathering stage in order to ensure that the results from the attacks that will performed are accurate.Also by having the knowledge that a WAF is in place the penetration tester can try different techniques in order to bypass the protections and to exploit any weaknesses in the web application. Muy bueno, gracias por compartir la información!, no conocía lo de Imperva. en_GB: Fabulous, you’re the man! You may have a look at Juniper Mykonos Intrusion Deception WAF… intriguing!